So it's February, which is a slightly better month than January. However it is still a chilly month. It also is the month of St. Valentine’s day making it a month that sadly does not celebrate the wonderful martyr St. Valentine, nor does it celebrate what love is all about. It’s mostly an excuse for sentimental hoo haw (you heard me - hoo haw) that has nothing to do with the real and rich nature of sacrificial love. Rather it’s all about buying some ugly stuffed animal and some chocolates - because nothing says I love you like a plush polar bear holding a heart?! Anyway I digress, if you're a cynic like me and like to see real romance, try these six films that will renew your hope in real love and ditch the sentimental clap trap. This is one of my favorite romantic films. I don’t know if it’s the lovely costumes, the witty lines or the fact that Cary Grant (who plays Nickie) and Deborah Kerr (who plays Terry) have a great spark. Whatever it may be, you should watch this film. The story is a usual one: Nickie and Terry are engaged...but not to each other. They each decided to go on a cruise without their significant others. Why did they do this? A rather feeble excuse is given for each, but I doubt anyone really cares because once they meet, all bets are off. They soon fall in love and to Terry's credit, she tries to resist falling in love with Nickie. But to quote Michael Scott in the sitcom The Office, "Engaged is not married" so the two plan to meet up at the empire state building after they break up with their respective fiance's. You will have to watch the film to see what happens. I love Steve Carell. Even if you're not a fan of The Office, I still think you will enjoy this movie. Steve Carell plays a widower with three daughters. I like this film because Steve Carell is not his typical outlandish and over-the-top, funny self. He is still funny but it's a dry kind of humor. His character Dan goes with his daughters to visit his parents and sibling for a family weekend. Along the way Dan meets a beautiful woman in a bookstore (best place to meet someone) and for the first time since his wife has died he starts falling in love again. However, Dan soon learns that this beautiful stranger already has a boyfriend who turns out to be his brother. It’s a great story of awkward situations, learning to love again, family and fun. This movie was not liked by a few friends, so I am hesitant to recommended it. But since it’s a leap year this year, I can’t resist. 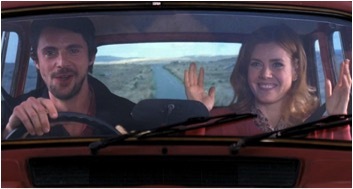 I really like Amy Adams and Matthew Goode (add Matthew’s Irish accent in this movie and the gorgeous green Irish landscape and I don’t see how you can go wrong). Yes this is just a "feel-good" movie, it’s cheesy and predictable but I also think it’s just one of those movies that can’t help but make you smile. So give this little Irish tale a try. This movie is the perfect Valentine movie. It’s a story about true love between a young married couple and their community. Peggy, played by Jeanne Crain (who was a Catholic in real life who stopped her career because she had seven children), is married to Jason Tyler (played by the handsome William Holden) who has just returned from the war and is working his way through college to become a teacher. He wants to become a teacher because during the war when he nearly died he was thinking of how he could make the world a better place. He decided it began by teaching children what truth, beauty and living well really means. He thought that if young people knew the truth and lived by it, there would be no more wars. The whole movie is about becoming a better person and helping others. Peggy is looking for a little apartment because she is expecting and she runs into an old, lonely Philosophy Professor who is thinking of committing suicide because he thinks he is no longer “useful” to the world. Sound like a familiar argument? The Professor soon changes his mind after meeting Peggy and Jason and seeing their love of life and love of others. This movie is beautiful and I have no idea why it’s not more well known, but it really is magnificent. 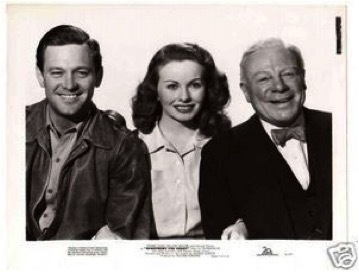 Jeanne Crain is such a charming actress and William Holden is at the height of his acting (and looks) in this film. So why not go house hunting with Peggy? You won’t regret it. The title says it all. Actually perhaps it should be called Crazy Stupid Lust. So why am I suggesting it, you ask? To be honest, I didn't expect much from this movie. It has Steve Carell, Ryan Gosling, and Emma Stone. The main storyline is about Steve Carell who after 30 years of marriage is told by his beloved wife that she wants a divorce. Steve Carrell’s character Cal is so flabbergasted he jumps out of moving car - but lives through it. He moves out of the house and misses his kids and wife and feels completely alone. He goes to a bar one night and meets Jacob, the very handsome Ryan Gosling character who has no problem picking up/hooking up with beautiful women every night. We find out Cal never slept around before he got married, so he decides it is time to run wild. Cal takes lessons from the suave Jacob on essentially - how to get women into bed. Real classy. Cal starts sleeping around and he finds he is still miserable. And Jacob, who is also "living the dream" of sleeping with a new attractive woman every night also realizes he is miserable. I don’t think it was the director's intent, but this movie is a very interesting portrayal of the destruction of lust. Jacob falls in love with Emma Stone’s character Hannah. He picks her up at a bar with the intent of sleeping with her - just like all the other women he picks up. But Hannah is different. She sees through his bull and calls him on it, showing him exactly how women can and do set the moral tone of society. It's true that a good woman can inspire a man to want to be good. Don’t get me wrong though, a man still has to accept the grace of God to change and no person can force another person to change. Each of us has to make their own choices. So ladies, he won’t change unless he decides he wants to change. This movie has a lot of honest moments. The two end up spending the night together, but end up just talking the entire night (I know - mind blowing), but it’s a pivotal moment. When Hannah asks Jacob how he likes his life of living like a rich bachelor sleeping around, he tells her he is just trying to fill the void. Cal also tells his wife later on that he was happy being only with her - something unheard of in our culture. The only problem I had with this movie (besides a scene where Ryan Gosling is inappropriately wearing very little clothing) is when Jacob all of sudden finds it easy to be in a monogamous relationship after living what must have been years of a lustful lifestyle - simply because he found the "one" and all his sinful habits magically disappear. A little unbelievable, absolutely. However this film is worth watching as it exposes the lies of lust, it’s actually quite funny, there's good acting, and there are a few great surprises within the storyline. So have a litte "philosophical wander" with this little number. Finally since Valentine's day has become such a silly holiday, I feel you need a really silly movie. I suggest Gentlemen Prefer Blondes. 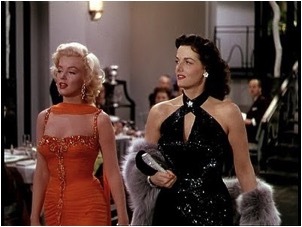 This movie is pure gold - from Jane Russell’s song and dance number with men exercising on a boat, to Marilyn Monroe's characters' many hilarious lines, her pursuit of men with money, her great love of diamonds, and her realization that diamonds can be worn on your head in the form of a tiara. This movie just can’t miss, especially if you are feeling jaded by Valentine's day. You will feel better after this film. So enjoy your Valentine’s day with your loved ones and snuggle up with your guy, your sisters, or your friends with these fun, crazy romantic movies. I really enjoyed this post - thank you. Good movies are tough to find (at least for me). Planning to give 'Dan in Real Life' a try this weekend! Dan in Real Life is one of my favorite movies. My husband and I watch it on an annual basis and never, ever tire of the story line. It's an authentic movie that truly tugs at the heart strings. Very happy to see it on your list!